On May 19 and May 20, 2018, Friends of Camp Geiger will sponsor their 10th Lehigh Valley Civil War Days, at the Whitehall Parkway Recreational Area on Church Street in Whitehall, PA. Event opens at 9:00 a.m. on Saturday. 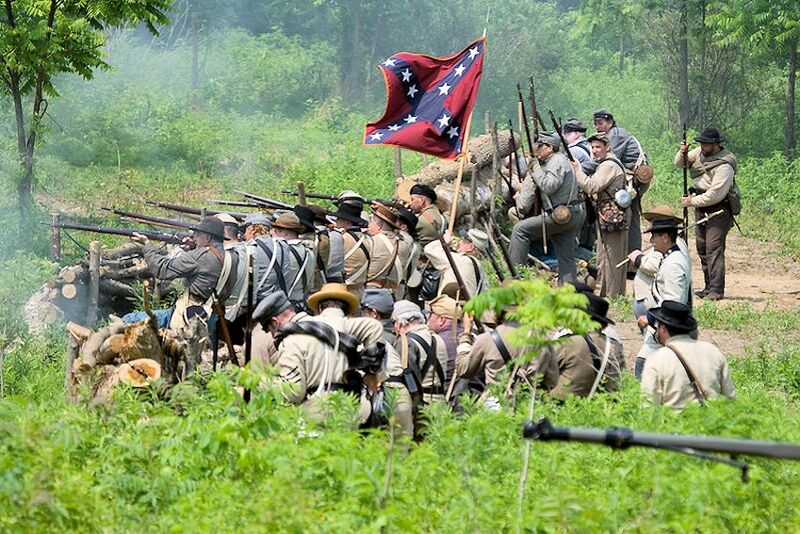 Jackson’s flank attack at Chancellorsville, which took place in May 1863, will be featured (the only known reenactment of the Chancellorsville Battle to take place this year). Jackson’s assault on the 11th Corp, in particular Northampton County’s 153rd PA regiment, forced the Union to retreat. The local reenacting group that portrays the 153rd PA Volunteers will be featured in this battle. The battle will be reenacted on Saturday at 3:00 p.m. A battlefield lecture by Jeffrey Stocker author of “We Fought Desperate”: A History of the 153rd Pennsylvania Volunteer Regiment will precede the battle. On Sunday, a reenactment of the battle of the Mule Shoe at Spotsylvania will take place at 11:00 a.m. Trench battles demonstrating the changing face of war will also be held each day along with behind the scenes tours of the trenches during breaks in the fighting. Military camps, a field hospital, displays on the US Sanitary Commission, Victorian parlor past times, children’s games, and a recruitment center will be among the offerings held daily. Lectures, a Victorian fashion show and period music will be offered at the Lyceum. The event closes Sunday at 1:00 p.m. Admission is free for spectators. Food is available. Donations to benefit Civil War battlefield preservation will be accepted. On Saturday night at 6:30 p.m. a period dance and concert will be held. Everyone is invited to attend. Weather permitting; a rifle firing demonstration is planned after the concert. Please do not wear period attire or bring weapons to the event unless you are a registered participant.